A word worth 9 points when playing Words with Friends or Scrabble (provided no letter occupies a space marked DL, DW, or TL). But that’s not really important. Unless, of course, you are playing Words with Friends or Scrabble. Obviously. What is important, however, is understanding the role that protein plays in your health. For starters, it helps your body repair cells and make new ones. Plus, it’s crucial for growth and development in children, teens, and pregnant women. Every single cell in your body contains protein. So protein, is kind of a big deal! Out of curiosity, I asked my children what their protein of choice was. Actually I asked them three questions. #1 was if they liked tofu, #2 what their protein of choice was, and #3, if there was a burger or steak in front of them, would they eat either one. (I assured them I was not judging and Christmas presents were not tied to their answers). And this is what I got back. The first response is from the middle born son. Very interesting! I totally was not anticipating the nut butter responses. Then I asked the husband. I didn’t threaten to take away his presents either, just in case you were wondering. His protein of choice….peanut butter. Really. I couldn’t make that up if I tried. I looked at him with raised eyebrows. He assured me that he didn’t mean any old peanut butter. It had to be chunky …and with salt. Thank goodness the man has standards. When I asked him when the last time he had chicken was, he thought about it and said, “Tofu.” Although it may have sounded more like “Tofu?” Yep. Thought so. Well, this works out very well for me, as I love tofu. Because what’s not to love? It doesn’t have a strong taste…it merely absorbs the marinade or sauce you use. So, as long as you have a great marinade/sauce, you are good to go. The texture of firm/extra firm tofu appeals to me as well. I liken it to a dry mozzarella. Kind of. 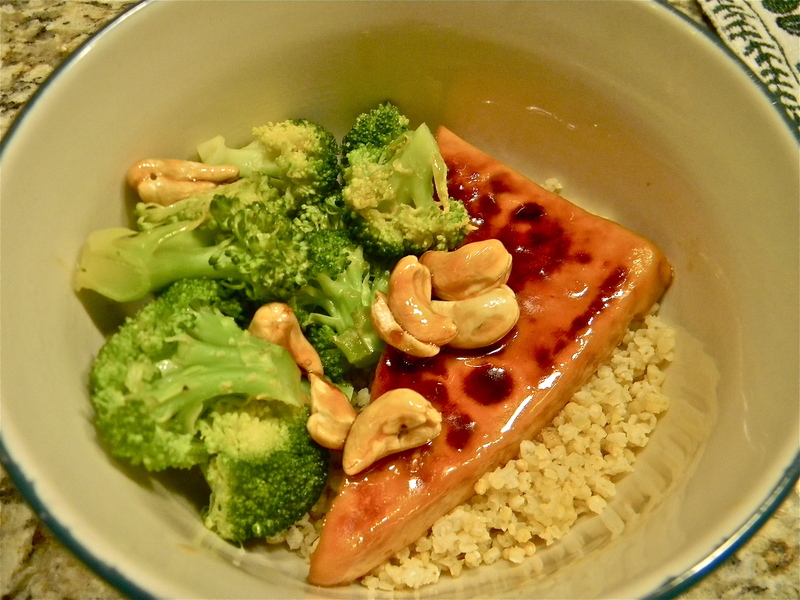 Here is one of our favorite tofu dishes adapted from Kathy Patalsky of Healthy.Happy.Life. 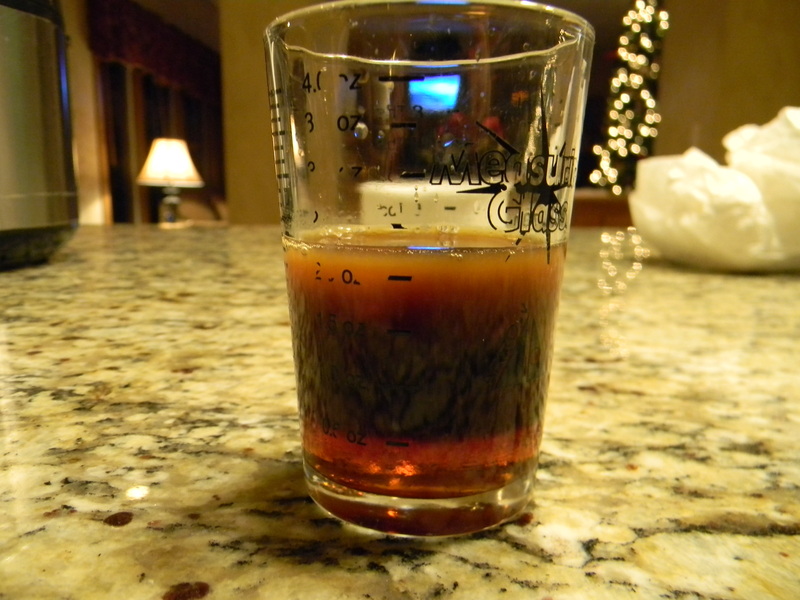 Her recipe is incredible, but mine is faster and involves fewer ingredients. I hope you give this a try…especially if you have never experienced tofu before! You will need a grain. 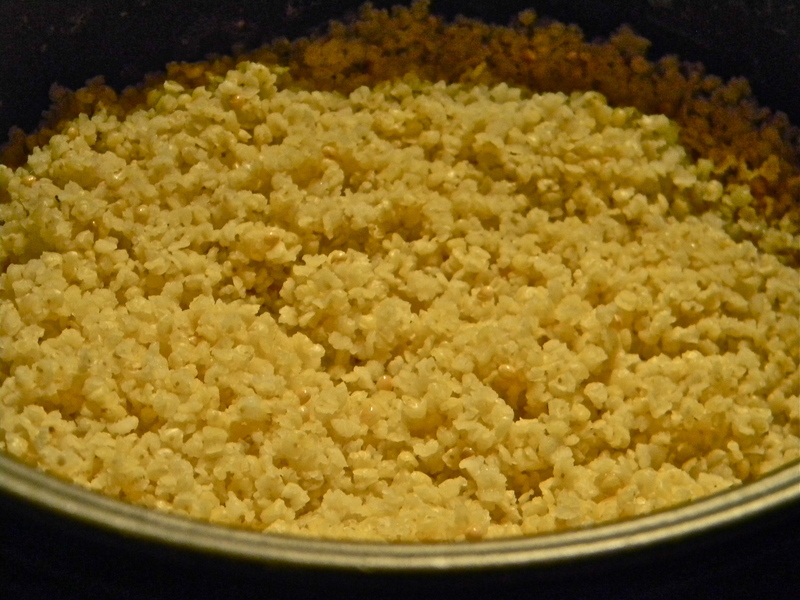 I cooked millet in my rice cooker. 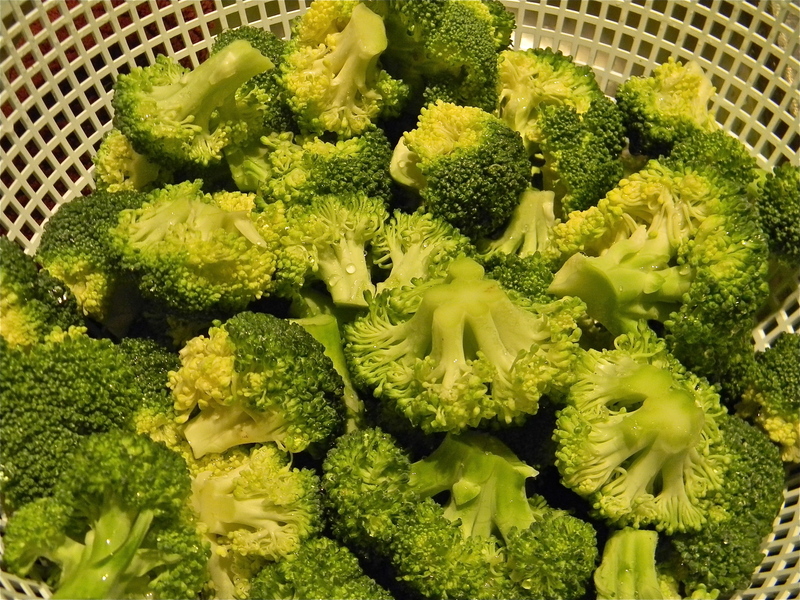 Wash broccoli and cut into bite size pieces. Make marinade for tofu…tamari, maple syrup, orange juice. liquid smoke and fresh garlic. Throw tofu in a hot pan…brown on both sides. Pour in the rest of the marinade and a handful of cashews. Then drizzle with more maple syrup. 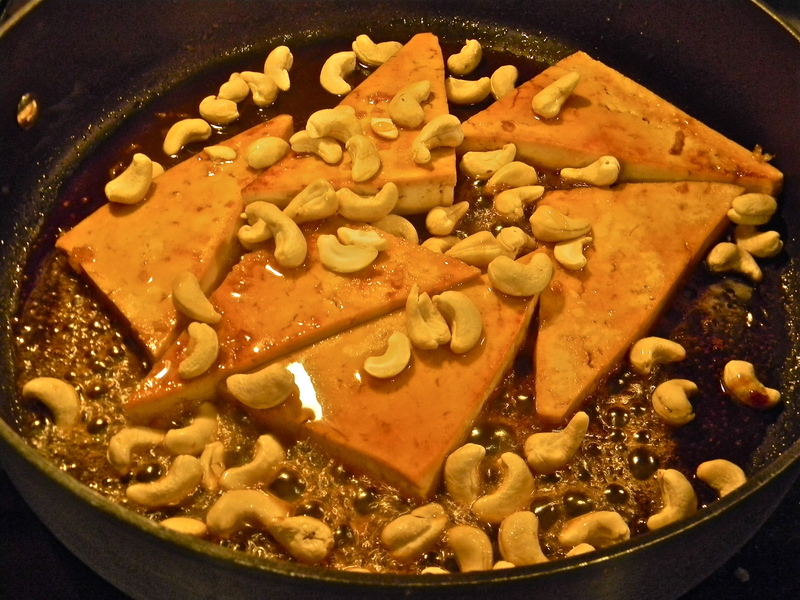 Remove tofu and cashews from the pan. Put broccoli and veggie broth in the pan and steam. 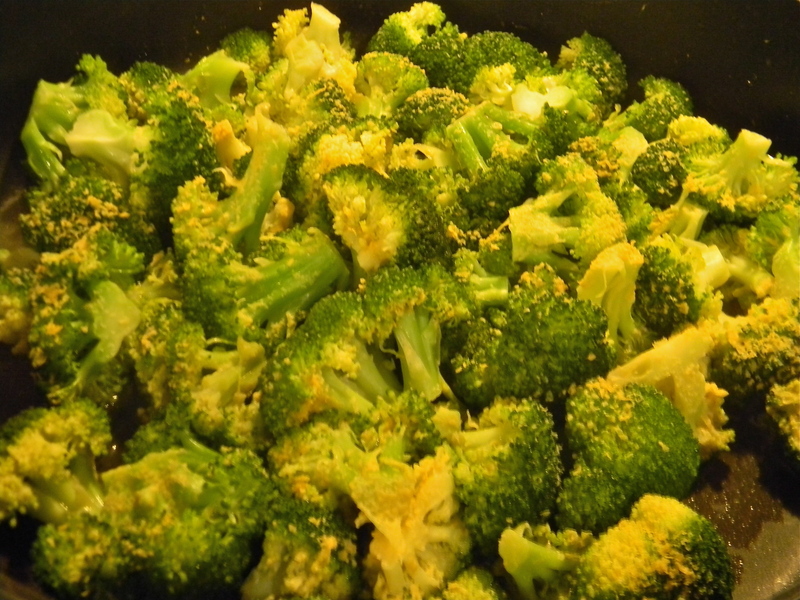 Then sprinkle with nutritional yeast. Press tofu (for directions on how to press tofu, click here). While tofu is being pressed (removes the moisture and allows it to absorb the marinade), prepare grain. I use my rice cooker. 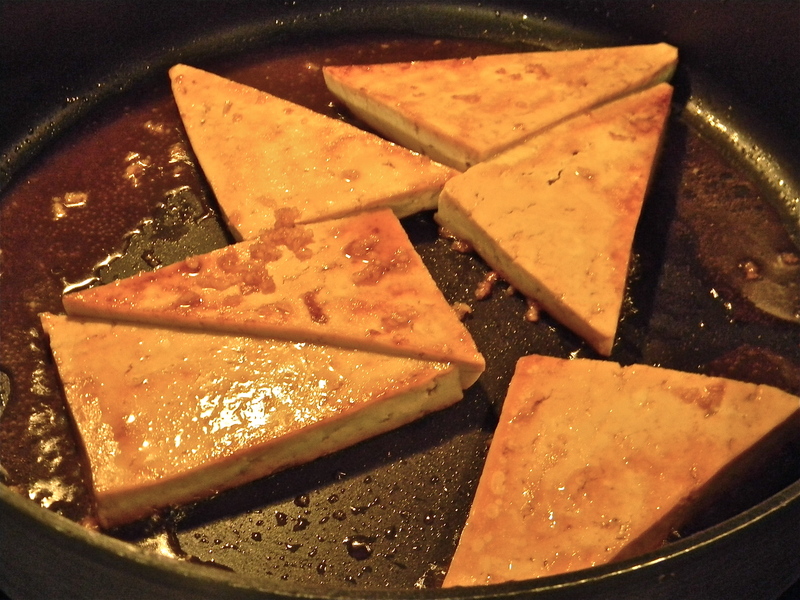 Once tofu is pressed (about 1/2 hour), cut into triangular pieces. I can get 6 pieces out of a block of tofu. 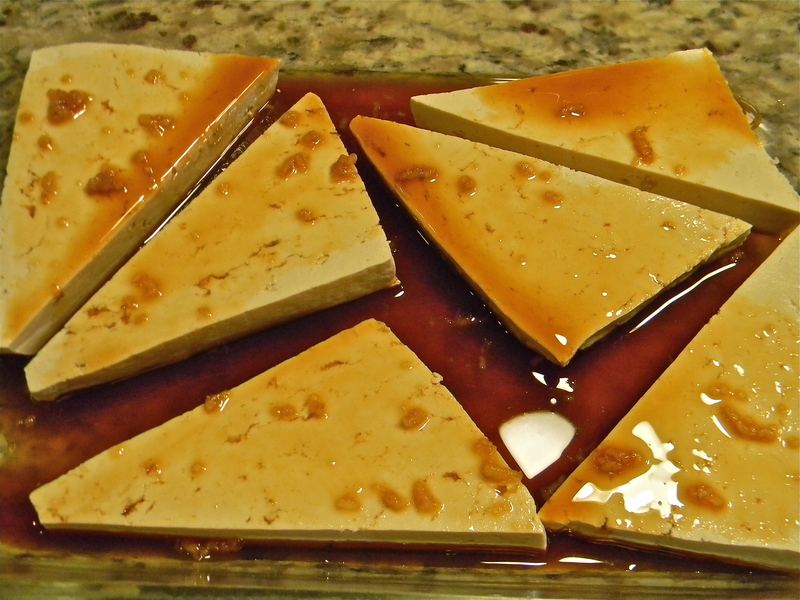 Place tofu in a glass pan. Then whisk tamari, 1 T. of the maple syrup, orange juice and garlic together. Pour over tofu. Marinade for a about 1/2 hour, flipping half way through marinading time. The longer you marinate it, the stronger the flavor. Then, when tofu is ready, heat a large pan, and add oil. Add tofu. Brown on both sides. Next pour the rest of the marinade on. Add cashews. 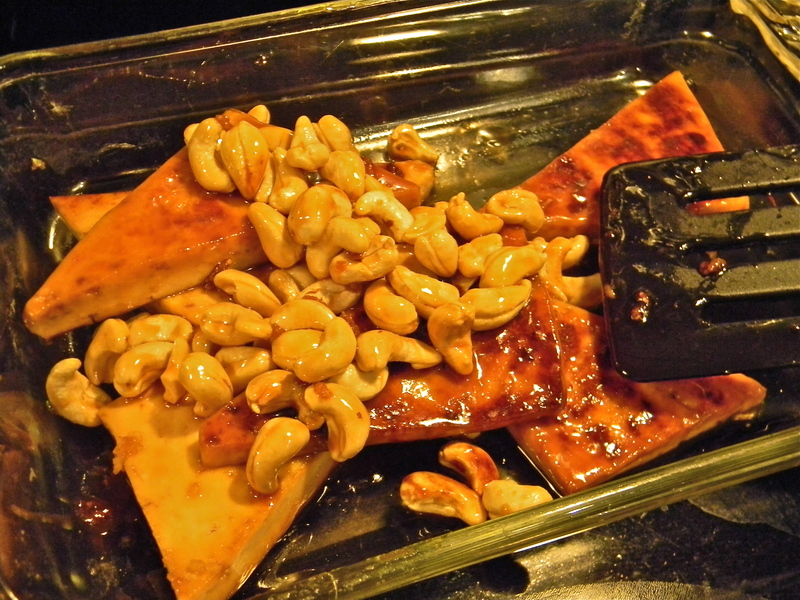 Drizzle on the rest of the maple syrup and cook until tofu/cashews get sticky, and liquid has cooked off. Remove tofu and cashews from pan. Then add broccoli and vegetable broth to pan (don’t worry if there is some stickiness left from the tofu/cashews). Cover and steam until crisp tender. Once your grain is cooked, you can assemble your bowl! Now, if you are still reading, I have a sweet/funny story. My husband, who never cooks, wanted to surprise me one day by preparing some baked tofu with BBQ sauce on it. Silken tofu is not the same as firm tofu. And he totally understands that now.